Let's talk about the new-ish Secret Sauce moisturizer from IT Cosmetics. This is going to be a short review. The packaging is gorgeous and feels super luxe. It's glass, it's heavy, and it's iridescent. What more could you want? So what does this moisturizer do? Well, here are the claims. This moisturizer is a heavier cream than I'm used to. It does take a little longer to absorb, but I will use this at night before bed and it sinks in as I sleep. In the morning, my skin is extremely soft and smooth. This does give a radiant glow and can absolutely be used in the morning as well, but if you're using it before makeup I recommend allowing at least 20 minutes for it to really sink in. This does not clog my pores or break me out and my skin is sensitive. It seems to be helping with fine lines and definitely gives my skin a hydrated glow. Overall, I really like it. I alternate this with the Confidence in a Cream Moisturizer, as well as the Urban Decay moisturizer. I like variety, what can I say? Haha, no here's the thing. Sometimes, I don't need as much hydration in the morning and I use the Confidence in a Cream, which is super hydrating but not AS hydrating or heavy. Sometimes, I forget moisturizer until it's time to put on my makeup and then I grab the UD moisturizer because it's a gel that sinks in instantly while hydrating well. Moral of the story? I have three amazing moisturizers that I alternate depending on the situation. You can find the Secret Sauce Moisturizer at It Cosmetics website & Sephora. 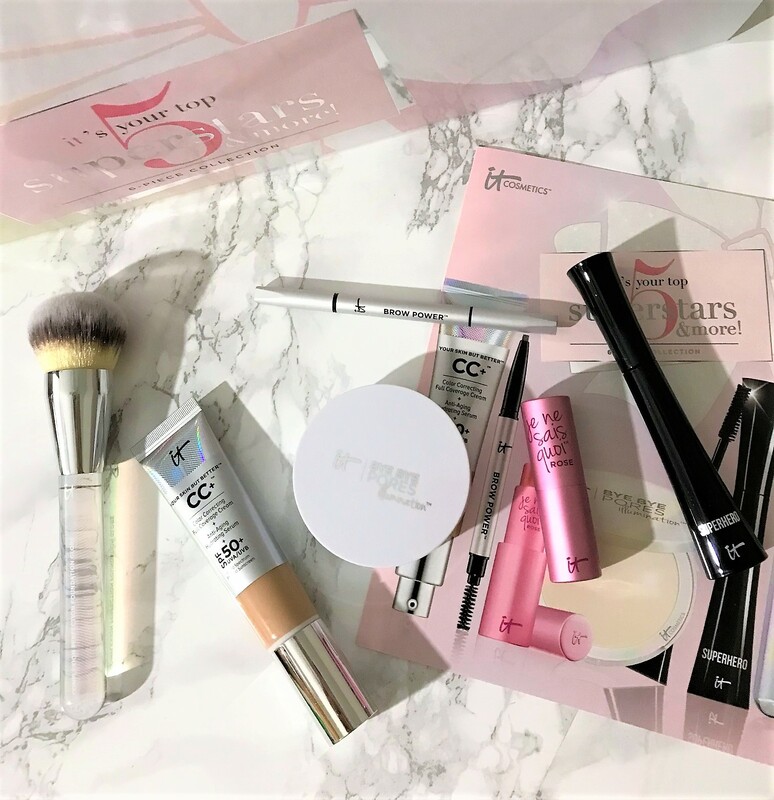 It's time for another IT Cosmetics TSV with QVC and it's on pre-sale now! 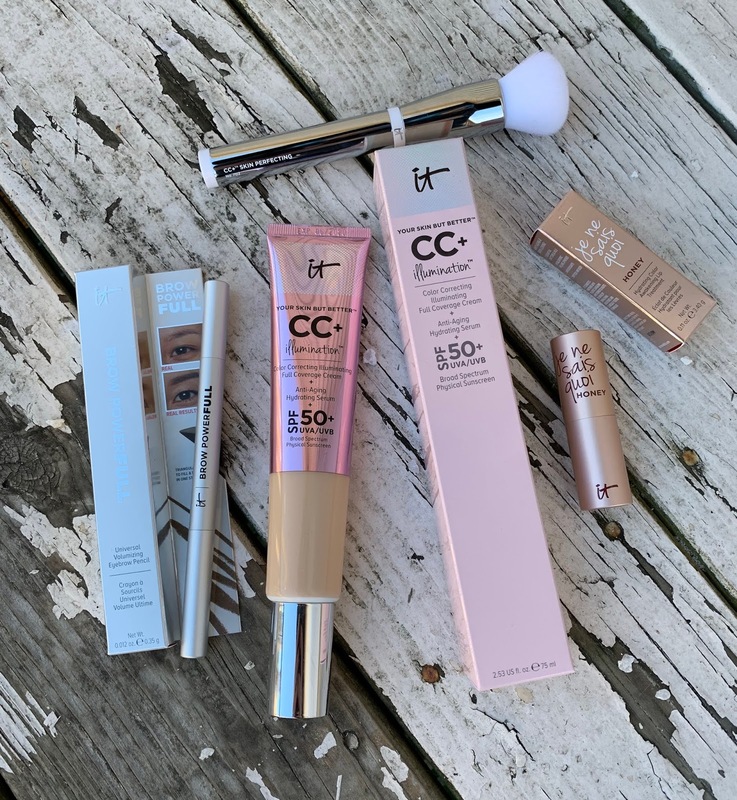 This is actually my favorite of all of the TSV's I've received as these are some of my favorite IT Cosmetics products, available in one bundle. Let's talk about what's included in the New Year New Confidence TSV. CONFIDENCE IN AN EYE CREAM : Anti-aging, moisturizing eye cream. This is my all time favorite eye cream and I seriously can't go without it. This is very lightly peach tinted to help disguise dark circles, but you really can't tell it's there because the tint is SO light. CONFIDENCE IN A CREAM : Moisturizing cream that also helps to blur pores and reduce the appearance of fine lines and wrinkles. This is a great moisturizer for all skin types, especially those of us with dry skin. It looks like it would be thick or heavy but it sinks in and melts into your skin so quickly without leaving behind any oily feeling. CONFIDENCE IN A COMPACT : Anti-aging solid serum foundation. This offers SPF 50+ and is infused with pure color pigments for high coverage without the heavy feeling. I use this foundation anytime I'm looking for a little more coverage. I love that it never feels heavy or looks cakey. CONFIDENCE IN A CLEANSER : Cleanses and moisturizes AND it's suitable for all skin types. This doesn't strip your skin, it leaves it clean but hydrated and I love that. This is sulfate and soap free. HEAVENLY SKIN SKIN-SMOOTHING COMPLEXION BRUSH : This brush is made to hug the contours of your face so your foundation will look airbrushed. 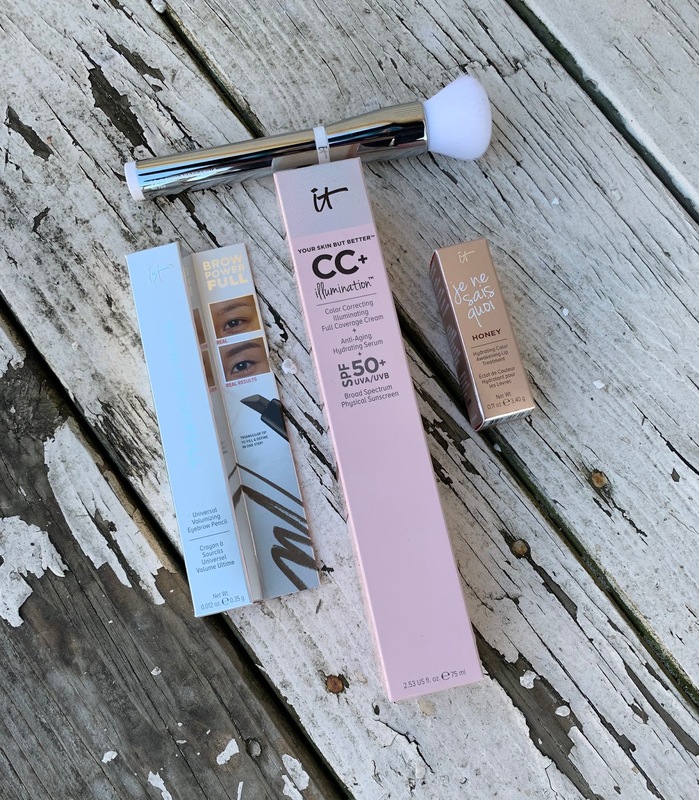 The IT Cosmetics brushes are my all time favorite, as they're SO soft and just do what they say they'll do. 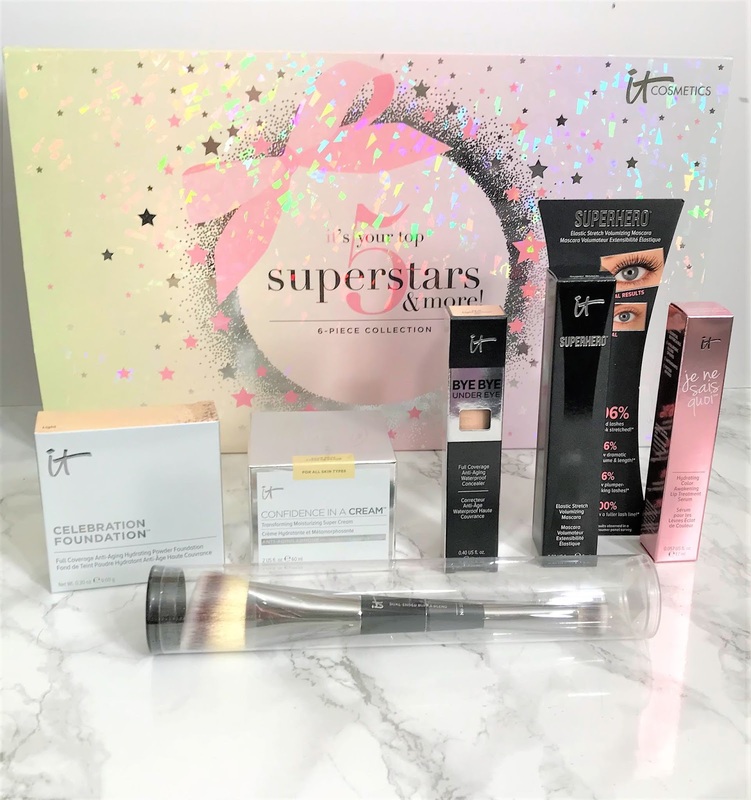 I love that this TSV includes so many of my personal favorite products and now's your chance to grab the bundle and save some money! You can find it now on pre-sale, and it officially goes on sale for 24 hours January 13th. If you decide to pick this up, let me know! I seriously think you'll love it. Also, let me know what your favorite IT product is in the comments! 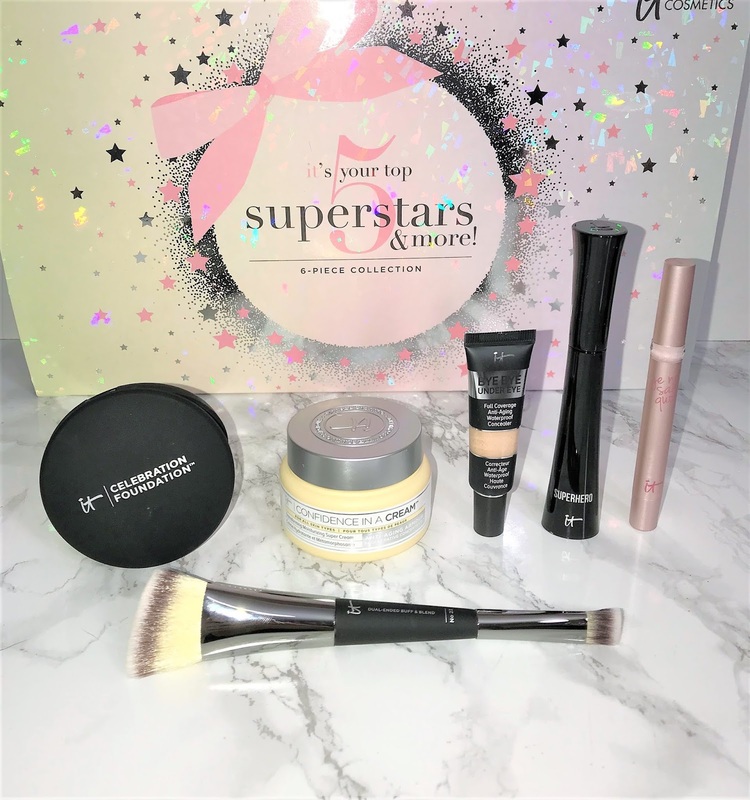 It's time for the IT's Your Top 5 Superstars & More QVC TSV. It's on presale now, so if you're interested, go ahead and grab it. This is a 6 piece set that includes some of IT's most popular products. 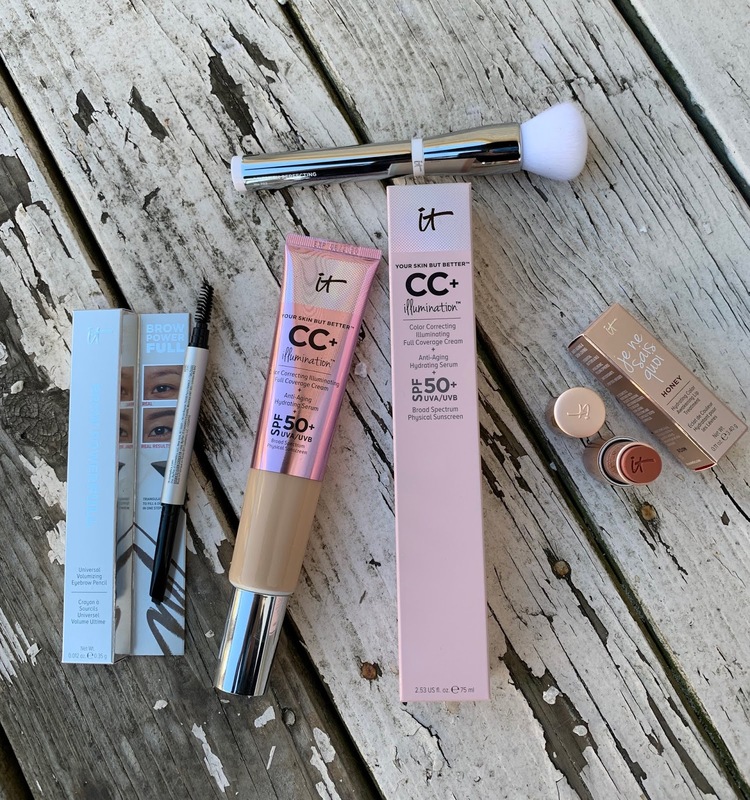 CC+ COLOR CORRECTING FULL COVERAGE CREAM: This is a full coverage CC cream with SPF 50+. I'm actually a huge fan of this CC Cream, as it can be applied lightly to give a medium coverage, which is what I prefer. It's great on my dry skin and lasts all day on me. BYE BYE PORES ILLUMINATION POWDER: This is a pore blurring pressed powder that also illuminates. It gives an airbrushed finish to the skin as well as a lit-from-within glow. This is dry skin friendly and has no shimmer or glitter. JE NE SAIS QUOI HYDRATING LIP TREATMENT: This is the newer rose-tinted formula that is great for your lips. It gives a nice rosy-tint that looks natural while hydrating and smoothing your lips with essential butters and oils, hyaluronic filling spheres, and antioxidants. This is a personal favorite and must-have for me. SUPERHERO MASCARA: This is a conditioning, volumizing mascara. This mascara is super black, gives length, and gives a ton of volume. It's a wetter formula and is prone to clumping, but if you're careful and don't apply too much at once, it's beautiful. BROW POWER UNIVERSAL BROW PENCIL: This brow pencil is made to work universally. It's infused with biotin and saw palmetto to enhance brows. This pencil has an oval tip and is long lasting. HEAVENLY LUXE COMPLEXION PERFECTION FOUNDATION GLOBE BRUSH: This is a new foundation brush meant to give your skin an airbrushed finish. This will work with liquids and powders and is SO soft. It's globe shaped as the name implies, with a holographic handle. I have used all of these products in the past except for the new brush. I really enjoy all of these products and I've always loved IT's brushes so this one will be no exception. As I mentioned above, it's official launch date isn't until the 11th but it's now on presale here. You're getting a $197.00 value for $59.94. 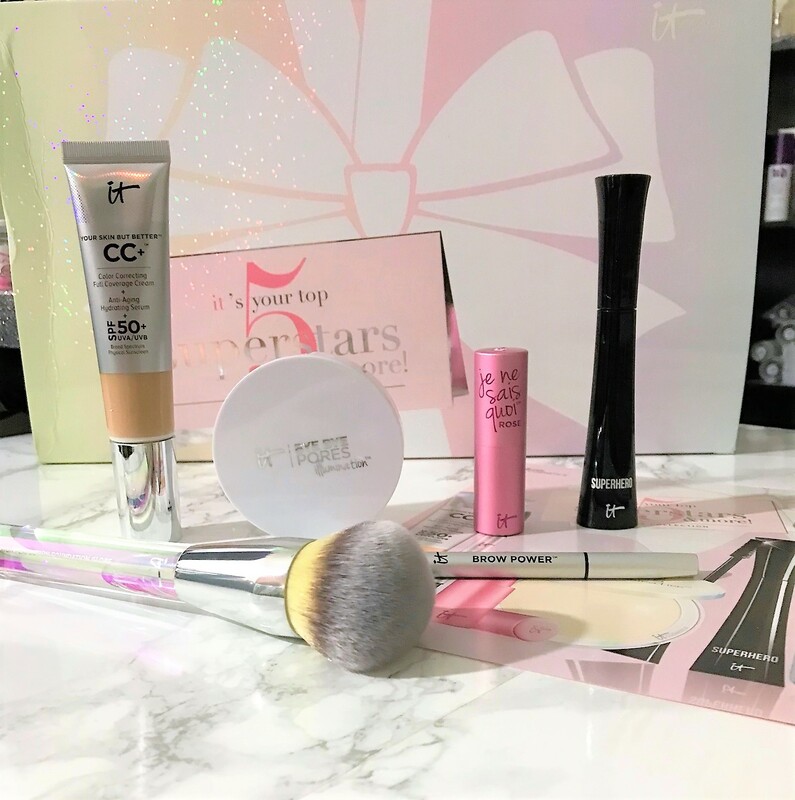 It's definitely a great way to try IT Cosmetics and some of their most loved products.